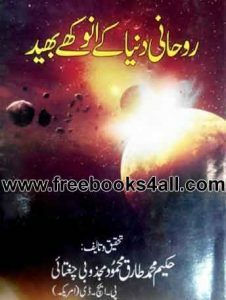 Rohani Dunya ke anokhay bhaid is an Urdu book written by Hakeem Muhammad Tariq Mahmood Majzoobi Chughtai. This book is about the peculiarly secrets of spiritual world. The Universe is a secret and is full of secrets. If Allah want, disclosing the secret of the universe on someone. The writer of this book wrote that many events happen in my practical life and I felt that there is a hidden system which is predominant from our apprehension. In this book the writer disclosed few secrets of the hidden system of the universe, but one thing is very important to do hard work and struggle for it to understand it. You will observe that how much you struggle, and that is the secret of this universe. The writer wrote that I will struggle that you understand the secrets of the universe to understand the Creator of this universe that what He required from His worshipper.